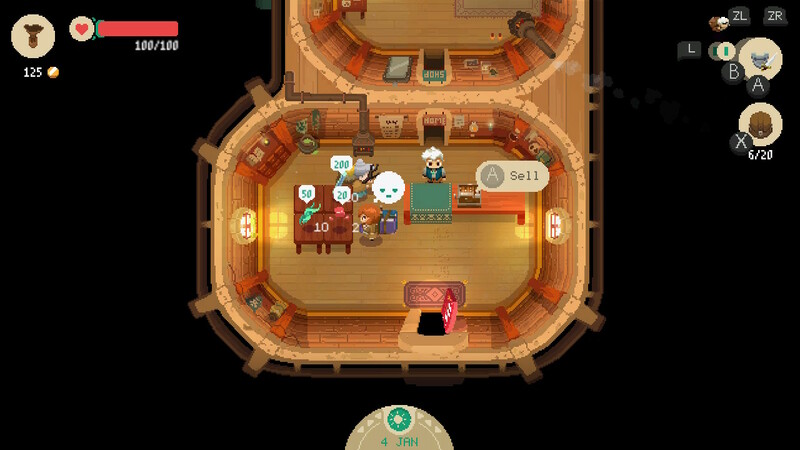 Summary: Moonlighter is a fun, unique mashup of 2D dungeon crawler meets small business simulator. 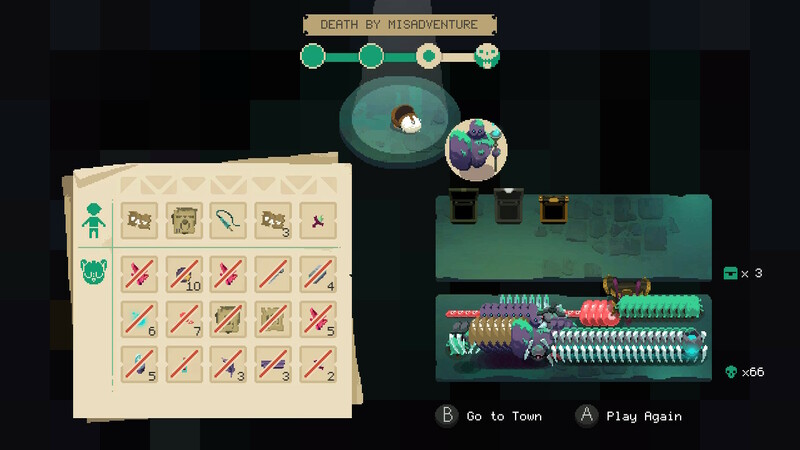 I feel compelled to begin this review of Moonlighter with a public service announcement: If you’re the type of person that easily gets sucked into an endless loop of ”just one more level/quest/round, then I’ll stop”, you should stay far away from Moonlighter. This game has one of the most addicting gameplay loops I’ve ever encountered and I’m surprised I was able to claw my way out of that vicious cycle for long enough to write this review. 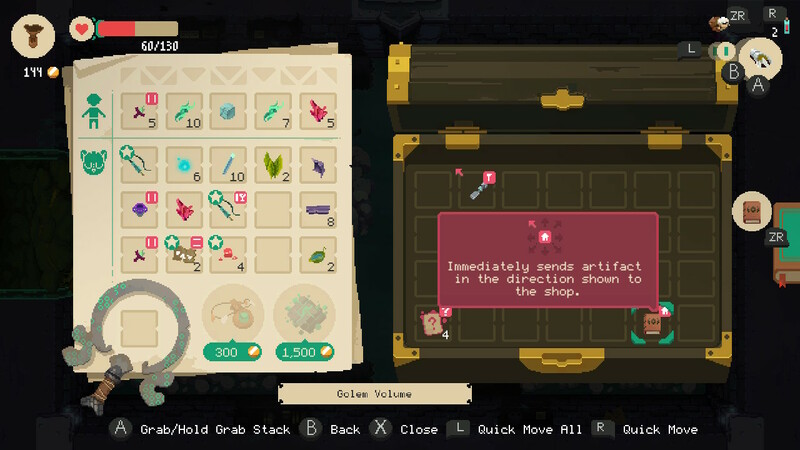 Moonlighter is a top-down 2D dungeon crawler where you play as Will, a courageous, monster-slaying adventurer by night and savvy proprietor of Rynoka’s most popular treasure store by day. 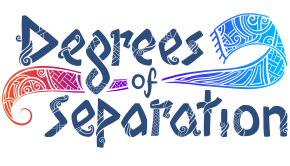 The game is split into two distinct, yet intrinsically entwined gameplay sections. 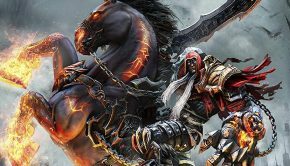 The majority of your playtime will be spent exploring dungeons, slaying monsters and collecting the various materials that they drop. When your bag is full of treasures, you’ll return to your shop in town (the Moonlighter) and stock the shelves with your plundered wares before opening the doors to the public for a day of trading. The profits made from selling your wares are then used to purchase dungeoneering supplies, upgrade your store and to improve your weapons and armour. Thus allowing you to venture deeper into the dungeons to take on stronger enemies that drop more valuable loot. You can see how this positive feedback loop can spiral on, but what makes it so viciously addicting is how satisfying and fun each of these aspects of the gameplay loop are. We’ll start with the adventuring, because that’s where you’ll be spending the most time. 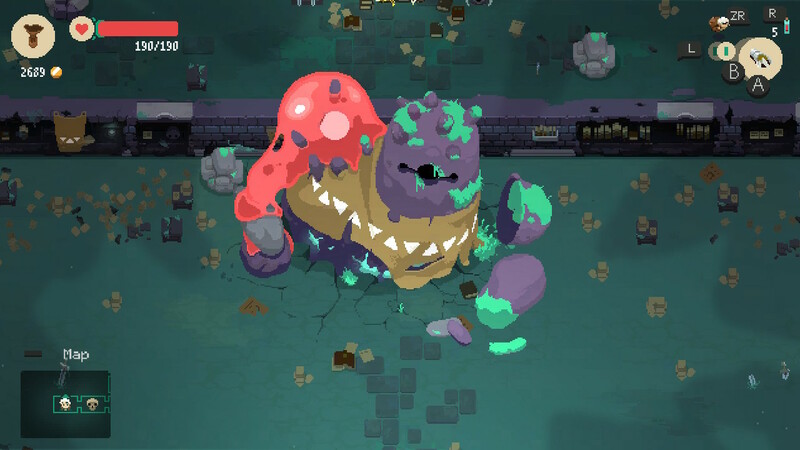 Dungeons in Moonlighter are procedurally-generated and consist of three levels that increase in difficulty and culminate in a boss on the fourth floor. 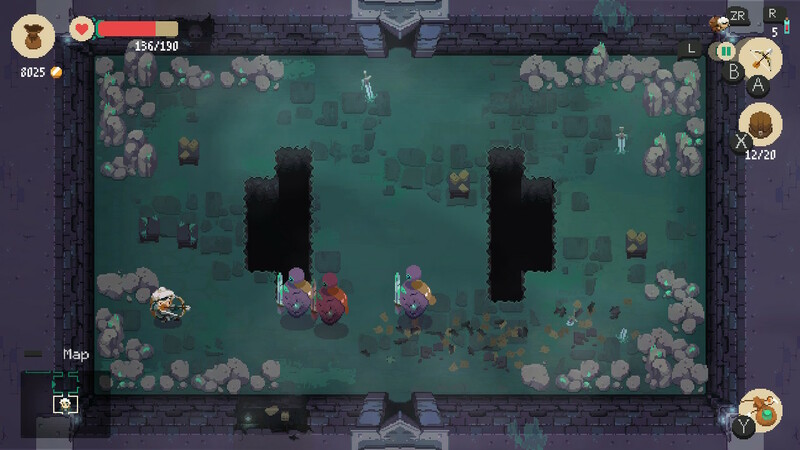 Dungeons are made up of a number of procedurally-generated, interconnected rooms that give off strong Legend of Zelda meets Binding of Isaac vibes. There are four different dungeon biomes that are unlocked by defeating the boss of the previous dungeon. Each of these dungeons feature unique enemies, hazards and loot, with more difficult enemies being introduced as you venture deeper into each dungeon. Combat is fairly straightforward, yet undoubtedly compelling. There are a variety of weapons available including swords, bows and spears. Each of these has a simple attack combo that is performed by tapping the ‘A’ button (on the Switch) and a special attack performed with the ‘B’ button. 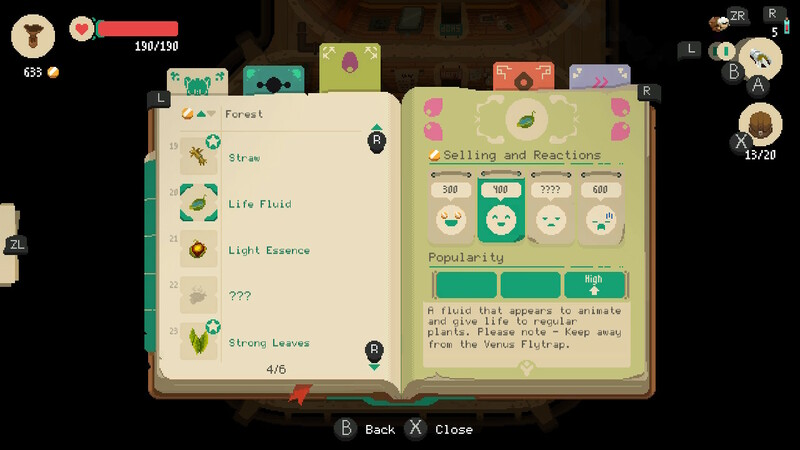 The player can also roll to avoid damage by tapping the trigger and consume an equipped health item by tapping the shoulder button. The challenge lies in the way you utilise these abilities to dodge enemy attacks, avoid hazards in the level and strike enemies when they are exposed. When you’ve filled your backpack full of goodies, you can hold the ‘Y’ button to warp out of the dungeon and return to town. 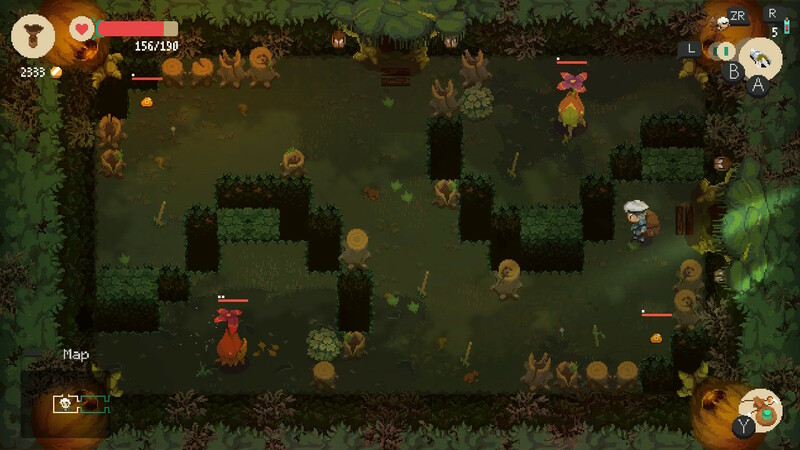 Doing so will reset the dungeon and you’ll need to start a new run in a completely different dungeon layout when you want to go back through. However, an item acquired later can create a portal that allows you to re-enter an existing dungeon for a fee. If you run out of health in a dungeon, you’ll lose all the items in your backpack before waking up in town, which can be absolutely devastating. 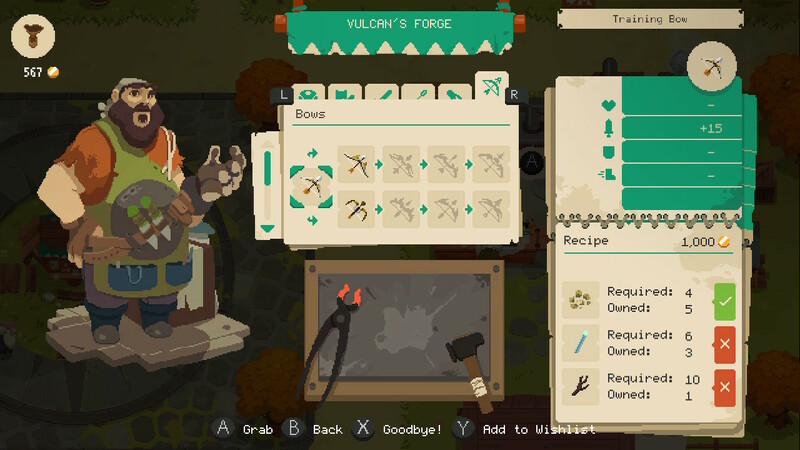 The adventuring side of things may take up the most time, but the business management aspect of Moonlighter is just as enjoyable and makes the game quite unique. To begin selling, you must first stock the item on your shelf and set the price. Setting the right price for an item is an art unto itself, as there are many factors that influence what your customers will be willing to pay. Distinguished looking customers are more willing to pay exorbitant prices for rare artifacts and adventurers are more likely to purchase weapons and equipment than crafting materials. Customers will let you know what they think of your asking price with an icon expressing their opinion. Prices also fluctuate depending on their supply and demand in the market. 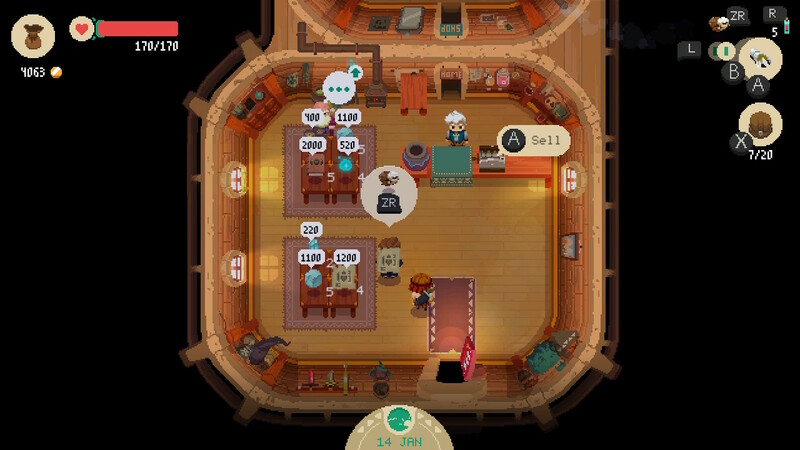 Repeatedly stocking and selling a single type of item at the Moonlighter will flood the market and cause the value to drop. If this all sounds a little daunting, don’t worry – everything is tracked in your journal so you can easily see the value of an item you’ve previously sold and whether or not it is in market demand. 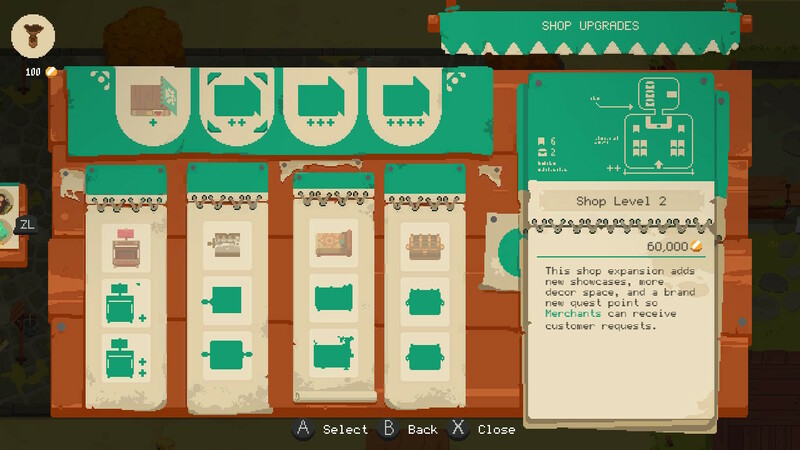 It’s actually a rather simple retail system, but it’s really quite fun to efficiently manage your business and play the market mogul. 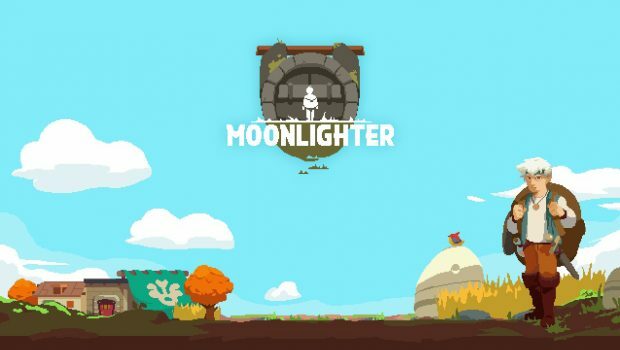 A cute, colourful pixel-art aesthetic ties all the gameplay elements of Moonlighter together to create a fun, exciting 2D world to immerse yourself in. Characters and enemies are nicely detailed with some cool animations and designs, whilst the dungeons all look unique and have great aesthetic variety. 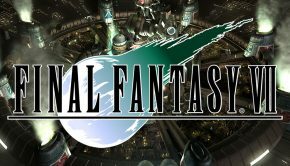 A strong, atmospheric orchestral soundtrack tops it all off and adds a great sense of character and life to the world. 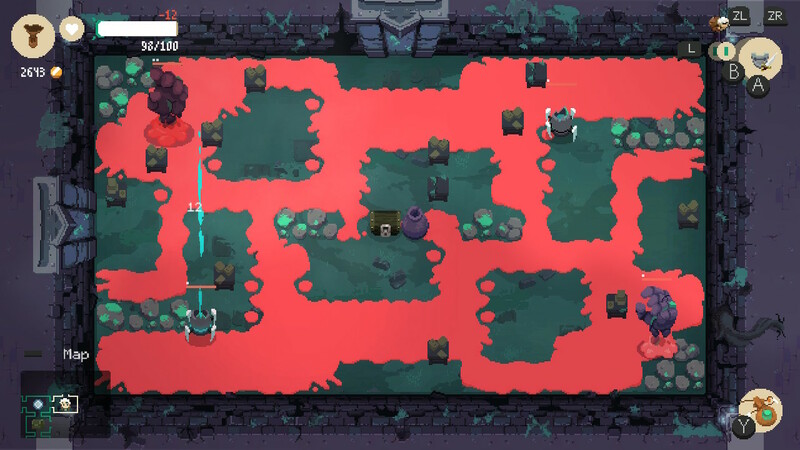 It’s hard to think of something I don’t like about Moonlighter. I hate losing all my items when I die in a dungeon, but I enjoy that risk/reward. I noted one or two framerate drops on the Switch when it was undocked, but they were so rare that I’m not sure that they even happened. 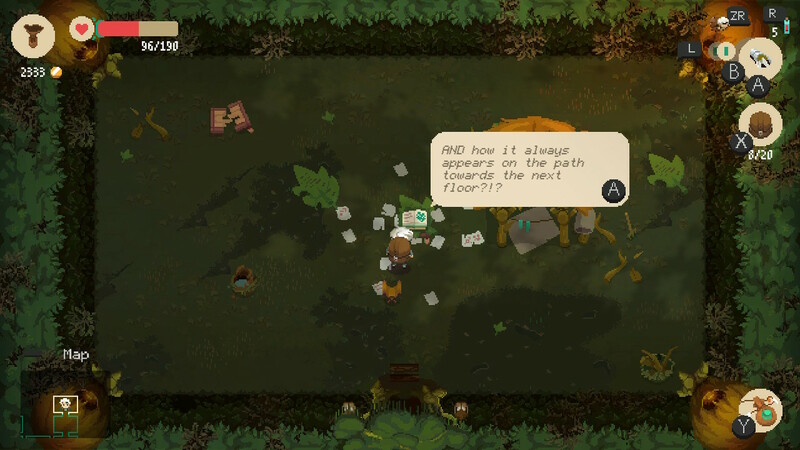 It’s much easier to list out the things I really like about Moonlighter. Such as the combat, the business management, the meaningful upgrades, the colourful visuals and the myriad of streamlined systems that make playing the game an absolute joy. 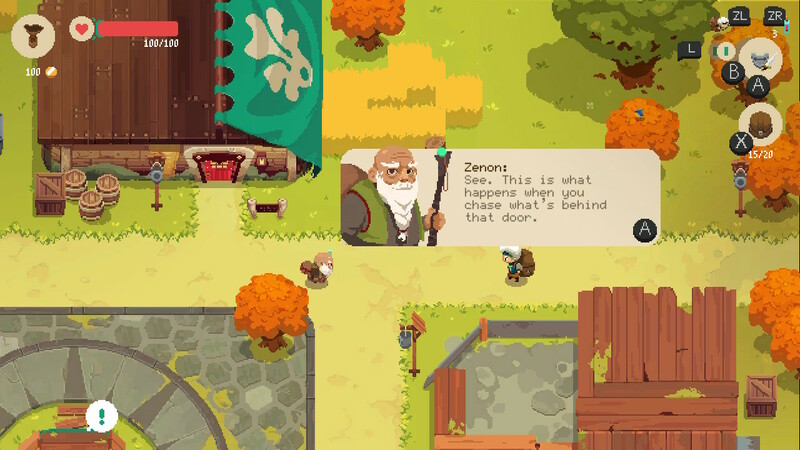 If you’re into 2D adventure games, Moonlighter mixes up the formula in some fascinating ways to create a fun, unique experience.